A typical car engine has an engine block with cylinders bored in either a straight line or a "V" configuration. 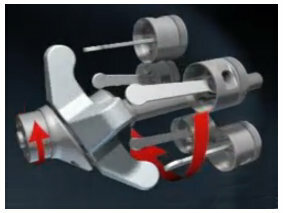 The pistons, connected to a crankshaft, reciprocate up and down (or side to side) in these cylinders, causing the crank to rotate and produce power. 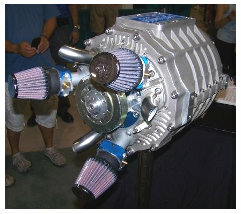 Like modern auto engines, the Duke axial engine is a piston engine, but that is where the similarities end. The Duke engine has its cylinders arranged in a circular or barrel shape (think of a revolver handgun where the bullets are placed in a revolving cylinder). Like a revolver handgun, the Duke engine cylinders or barrel also rotates. While it's rotating, the pistons move up and down. Similar to a rotary engine, the 4-stroke combustion cycle does not occur all in the same chamber. The engine has a stationary head and as the cylinders and pistons rotate around the center shaft, they pass by the intake, spark plugs and exhaust ports (their 5-cylinder engine only requires 3 intake/exhaust and spark plugs). Like a rotary engine, this means that seals may be a potential weakness. The Duke engine has quite a few positive aspects, including the fact that it generates as much horsepower and torque as a comparably sized conventional auto engine but weighs nearly 20% less. The current iteration of the Duke has lots of room for weight reduction improvement too. Another advantage of the engine is that it is smaller than its competitors (somewhere around one third of the size) and it uses significantly fewer parts. Because the axial engine doesn't use valves, there is more flexibility allowed for the design and shape of the combustion chamber. This has allowed for cooler running intake and exhaust ports that allow the engine to run higher compression. In fact, they've tested as high as 14:1 using 91 octane gas. They've also successfully experimented with Jet Fuel, which indicates that a diesel engine is a good possibility. Duke is currently looking for the right application to commercialize their engine. Although auto manufacturers would seem to be the obvious choice, that can be a tough row to hoe. Auto makers spend significant money in designing their engines and for them to jump to a completely different type of engine is quite a gamble on their part. The most promising opportunities for the engine may come from other industries. One option is the light aircraft sector where small, light weight and efficient engines can make dramatic improvement in airplane performance. Another industry that may take to the Duke is the power generator manufactures. Being able to build physically smaller generators that are lighter to ship and transport is a significant accomplishment. Marine (power boats) is another possibility.